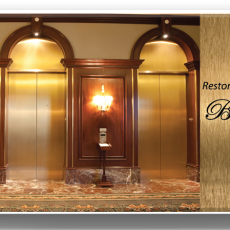 Shineguard offers a both elevator repair and refinishing service and a restoration service to all brass and metal surfaces. We restore all your elevator brass bronze and other metal surfaces to original factory condition through our proven methods and techniques. This service includes removing existing finishes and damage, restoring base metal to original luster, and applying the Shineguard finish to seal and protect your surfaces. Shineguard is able to restore both brushed and mirror brass finishes to their original condition.